Providing you the best range of safety connecting lead, lightning and switching surge arresters, surge protection for industries, lightning and surge arrester, lightning arrester for the commercial buildings and combined surge protection for main lt panels with effective & timely delivery. 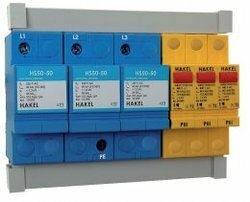 Hakel Combi Set is lightning and surge arrester type 1+2 according to EN 61643-11 and IEC 61643-1. 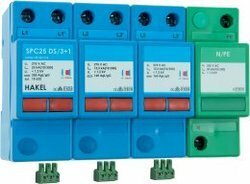 These are recommended for use in the Lightning Protection Zones Concept at the boundaries of LPZ 0 – 2 (according to IEC 1312-1 and EN 62305) for lightning current equipotential bonding and elimination of switching surges that originate in power supply systems entering the building. 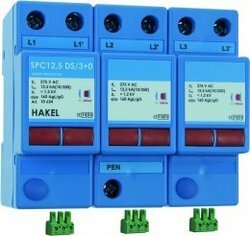 Hakel Combi Set is a combination of the latest technologies where the spark gap combines the varistor. The set contains lightning arresters of HS series and surge arresters of PIII series. 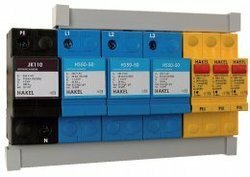 HCS can be installed in every common switchboard and its special construction is intended for using in non-measurable parts of electrical systems. HCS/3+0 can be used in industrial installations such as substations, main switchboards of large industrial structures and also places with high risk of a direct lightning strikes occurance. This device is intended for use in TNC power supply system. In harsh industrial environments maximization of operations is imperative. The downtime, damage, & destruction caused to mission critical systems costs businesses millions of ruppees each year. Application - Ensure that the SPD is designed for the zone of protection for which it will be used. For example, an SPD at the service entrance should be designed to handle the larger surges that result from lightning or utility switching. System voltage and configuration - SPDs are designed for specific voltage levels and circuit configurations. For example, your service entrance equipment may be supplied three phase power at 480/277 V in a four-wire wye connection, but a local computer is installed to a single-phase, 120 V supply. Let-through voltage - This is the voltage that the SPD will allow the protected equipment to be exposed to. However, the potential damage to equipment is dependent on how long the equipment is exposed to this let-through voltage in relation to the equipment design. In other words, equipment is generally designed to withstand a high voltage for a very short period of time, and lower voltage surges for a longer period of time. The Federal Information Processing Standards (FIPS) publication "Guideline on Electrical Power for Automatic Data Processing Installations" (FIPS Pub. DU294) provides details on the relationship between clamping voltage, system voltage, and surge duration. As an example, a transient on a 480 V line that lasts for 20 microseconds can rise to almost 3400V without damaging equipment designed to this guideline. But a surge around 2300 V could be sustained for 100 microseconds without causing damage. Generally speaking, the lower the clamp voltage, the better the protection. 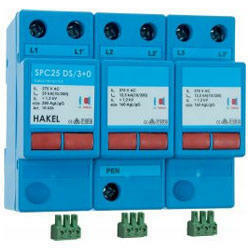 Surge current - SPDs are rated to safely divert a given amount of surge current without failing. This rating ranges from a few thousand amps up to 400 kiloamperes (kA) or more. However, the average current of a lightning strike is only approximately 20 kA., with the highest measured currents being just over 200 kA. Lightning that strikes a power line will travel in both directions, so only half the current travels toward your facility. Along the way, some of the current may dissipate to ground through utility equipment. Therefore, the potential current at the service entrance from an average lightning strike is somewhere around 10 kA. In addition, certain areas of the country are more prone to lightning strikes than others. All of these factors must be considered when deciding what size SPD is appropriate for your application. However, it is important to consider that an SPD rated at 20 kA may be sufficient to protect against the average lightning strike and most internally generated surges once, but an SPD that is rated 100 kA will be able to handle additional surges without having to replace the arrester or fuses. Standards - All SPDs should be tested in accordance with ANSI/IEEE C62.41 and be listed to UL 1449 (2nd Edition) for safety. HCS/3+1 can be used in industrial installations such as substations, main switchboards of large industrial structures and also places with high risk of a direct lightning strikes occurance. 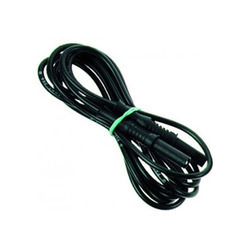 This device is intended for use in TNS and TT power supply systems. SPC is lightning and surge arrester type 1+2 according to EN 61643-11. 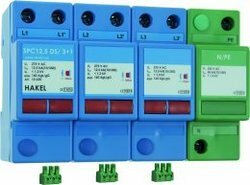 These are recommended for use in the Lightning Protection Zones Concept at the boundaries of LPZ 0 – 1 (according to IEC 1312-1 and EN 62305) for lightning current equipotential bonding and elimination of switching surges that originate in power supply systems entering the building. The SPC 12,5 is intended for use in TNC systems (1+0 or 3+0). For TNS and TT systems (1+1 or 3+1) the SPC 12,5 is equipped with high energy gas discharge tube for equipotential bonding between N and PE. The main use of SPC12,5 arrester is in structures of LPL II according to EN 62305, e.g. industrial and administration buildings, schools, supermarkets and cathedrals. When the SPC12,5 DS is operating correctly, the terminations 1-2 are connected to normally closed contacts, 2-3 are normally open. If the internal varistor component is damaged as a result of thermal overloading, terminations 1-2 will then be open and 2-3 closed. The SPC25 is intended for use in TNC systems (1+0 or 3+0). For TNS and TT systems (1+1 or 3+1) the SPC25 is equipped with high energy gas discharge tube for equipotential bonding between N and PE. The main use of SPC25 arrester is in structures of LPL I according to EN 62305, e.g. hospitals, banks, mobile operator stations, water-stations, power plants, airport buildings for air traffic control and all structures with explosive risk. To be installed in the main switchboard. 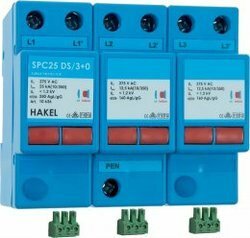 When the SPC25 DS is operating correctly, the terminations 1-2 are connected to normally closed contacts, 2-3 are normally open. If the internal varistor component is damaged as a result of thermal overloading, terminations 1-2 will then be open and 2-3 closed.